My name’s Rebecca and I love Physics. Sounds like something from a Physics Anonymous group! But when a child’s face lights up because you’ve shown them some ‘magic’ and explained why it works because of the science behind it I love it! Outreach is so important! The last two weeks have been very outreach focussed for me with various activities with the CDT-CMP and the Multiphoton Nanophotonics group at the University of Bath. 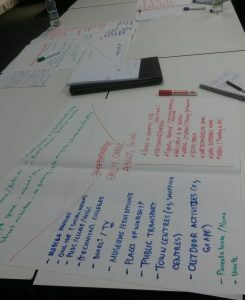 Through the CDT-CMP and SAMBa (the physics and maths CDTs at Bath) we had an afternoon on ‘Designing a Public Engagement activity’ where we explored the impact outreach can have. Inter-CDT groups each developed an activity for a specific age group, so by the end of the afternoon we had multiple outreach event ideas: at a festival to reach young adults on the impact of climate change, at a pub to reach working adults illustrating the maths behind everyday activities with ‘magic’ and finally a garden at the Chelsea Flower Show to show Maths in nature! The creative process we went through was really interesting to guide you through the aims and intent of your outreach activity and to really focus on what you are intending to achieve and how best can you reach your audience through this. 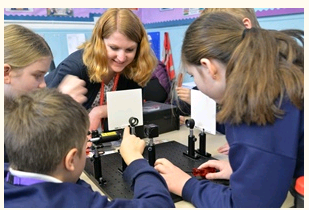 Following this, five of us spent a week working with Dr. Ventsi Valev who has developed a Science Workshop for Year 5 and 6 children to learn about his research in Multiphoton Nanophotonics. The Children LOVED it! The first 15 minutes of each workshop was a Robot lecture! Instantly a hit with the children and grabbing their attention! Photon the Robot told the class all about light, from the order of the colours all the way to “complementary colours” and why we see the sun as yellow. The class then dispersed into 5 smaller groups and worked on an activity with each of us before rotating to try everything. A discussion table with optical illusions illustrating how our eyes and brains perceive colour, a mini laser rig experiment where the children got hands-on assembling each optical component to build a beam splitter set-up, a light piano to emphasise how light has different frequencies like in music, Geomag to allow the children to explore crystal structures and work as a team to create them out of magnets and rods and finally a meta-atom station where the children used mirrors to learn about chirality and design their own meta-atoms. Each of these stations provided a chance for the children to explore science, to have a go and to also have the chance to chat about ‘being a scientist’ with people who do this every day! 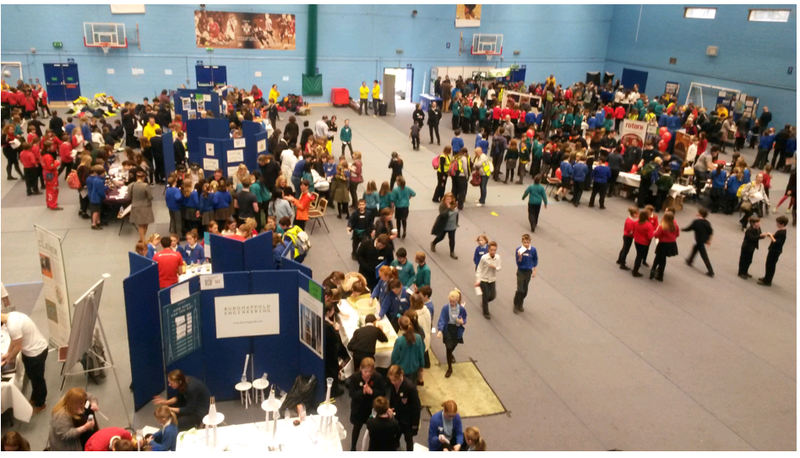 Every session created a real buzz about science! The children were really engaged and the teachers always commented on how great it had been for them all and were often surprised how some of the children who typically disconnect with lessons really engaged and remained so for the whole 2 hour session, whilst the brightest children were stretched with picking up new concepts and vocabulary. Condensed Matter in a fun and exciting way. We settled upon States of Matter…with a twist! 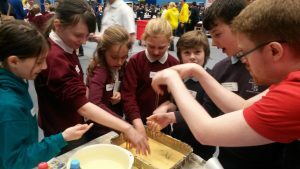 The children loved getting their hands in the cornflour mixture and learning about how Non-Newtonian fluids seem to act like both a solid and a liquid. They would even run off and grab teachers and friends to ‘come and feel this weird stuff’ where they would then re-iterate what they had just been told about this ‘magic’ fluid! Success! 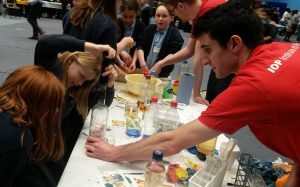 Other activities on our stall explored density, making a rainbow out of different sugar concentration water, along with watching lava lamps created when an Alka Seltzer tablet was put into a water and oil mixture. Along with a liquid nitrogen self-inflating balloon to illustrate the liquid-gas transition and expanding marshmallows when the children pumped air out of a wine bottle also being popular activities! Overall the past two weeks have been incredibly fun! 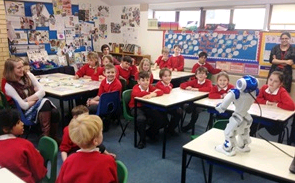 Being able to interact and explain to children how science is fun and exciting has been great! As we learnt in the Public Engagement Training, age 10 and 11 is the time when children decide whether they like science or not. 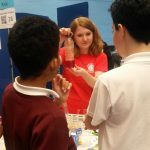 Having the opportunity to enthuse and show that age group that science really can be fun and exciting and seeing them really enjoy it has been amazing!